NB: Two other articles are extraordinarily relevant at present: the problems and their solutions, as put forward by the Master, are still urgently applicable. For the Master’s insight into the international community’s present challenges please see: “Aiding the cause of peace” (SI, July/August 2003), and “Further thoughts on Unity” (SI, September 2012), also included in A Master Speaks Volume Two. Should they fail to do so, they threaten the very existence of the race. Peace is no longer an option for men. They have now in their hands the deadliest weapon of all time which, if used in major war, would desecrate the planet and leave it lifeless for aeons of time. Why, then, court such disaster, such an end? A. The astral body is a mechanism; it is part of you. You are made up of energies. Q. Where can it be said to be located? A. In the solar plexus centre or chakra. It is ‘inside’ and ‘outside’. The physical body is made up of muscle, bone, blood, sinews etc, but behind that, substanding it, there is just energy. Everything in the physical world is in fact energy taking that form. So, if you saw yourself energetically you would just see a pattern of slow movement of energies coming and going, criss-crossing, moving, flowing, in different colours, different hues, some at slightly different speeds. And where these energies criss-cross each other, you have chakras or energy centres. Where you have absorbed mental energy, the mental body is made. Where astral energy is absorbed, the astral body is formed. As you attract the energy in, it goes in and out; the more you use astral energy the more powerful becomes the activity of your astral-emotional body. The aim of evolution is to still the astral-emotional body which is the most powerful body we have because it took about 12 and a half million years to perfect. It is so perfect now that it is the strongest and most difficult to overcome. Q. So is it accurate to say that the etheric is outside the physical body? A. Inside and outside. Energy can move in and go out, moving through the chakras. The energies move through the chakras – coming in and out – that make a body. They can also flow the other way, returning [into the body], changing, moving; it is a constant process. Q. Can we say that in the various interchanges of energy, the more subtle the body the further they extend outwards into space? A. No. The more effect it has on space. The higher [the vibration] of the body, the greater the magnetism of the person and that flows out into space. Q. Can we say that the astral body is a densification of astral matter? Is that accurate? A. It depends. It depends on the individual how dense it is. Evolution is about the refinement of the bodies, to come closer and closer to the Monad – the spark of God. So, an unevolved person would live mainly through the physical elemental. Each body consists of, is made from the activity of tiny devic lives or elementals. I suppose that is easier to understand and imagine on the physical plane, but to understand it on the astral plane and especially the mental plane it becomes more difficult. But that is a fact. The bodies are made of the activity of devas, tiny little lives. And either we dominate the devas or they dominate us. And you do it one body at a time. You overcome the physical elemental; then you overcome the astral elemental; then you overcome the mental elemental – and then the soul can actually grasp the individual, the personality, and express itself through that person. Q. Is it the etheric body that gives the signals to the developing primary body cells (soon after conception) to grow into an arm or leg etc? A. The cells are physical. But the activity which brings them about is on the etheric level. As you evolve, as you go on, one life after the other, the body of the different personalities (life after life) makes up the physical plane representation. It is the soul that incarnates; the personality does not incarnate. The personality is the result of the soul’s incarnation and that soul incarnates as a divine intermediary between the Monad and the physical-plane personality. As that personality evolves and it changes under the influence of the soul, which is divine and made up of light, more and more sub-atomic energy is brought into the system. So instead of just being atomic all the way through there is more and more sub-atomic energy present. When we speak of polarization – it can be on any level: it could be physical astral, mental or spiritual. The polarization point is the level of the habitual focus of consciousness. For example: if you are physically polarized it means that the physical elemental would be most dominant in your life. But this is rather rare these days; most people have evolved beyond the physical polarization…. At the beginning of November 2001, I had an appearance of Maitreya, while I was dreaming. For me this was an instructive and encouraging experience that I would like to share with other readers. Actually my dream was about the Declaration Day of Maitreya. Not unlikely for a dream, there was lots of action, many images and scenes were mixed up with each other. But then all scenes disappeared at once. Instead of them, an audible and palpable buzzing was in the atmosphere, like being in the vicinity of an overhead high voltage electric cable. Then there was a tall man holding me with outstretched arms, like you do with a little child, so I was face to face with him. He was dressed in white, he had a dark complexion and high cheekbones. This image of Maitreya was not quite ‘sharp’, just like a hologram from a science-fiction movie. Unfortunately I can’t remember the exact words he spoke to me after waking up. So I tell it in my own words. First he asked me for his priorities, I should tell him three of them. Then he corroborated that he would come soon now. After that he told me, what importance this mission is for him, how dear his work is to him. And finally he had a question of a personal nature, referring to our group work, which would not make sense having it printed here. Did Maitreya give me this dream? On 14 August 2017, when my son Samson and I were on the train home from visiting my parents, a woman got on at Wellington Point. Although we were the only people in the carriage, she sat next to us. After a while, she joined in our conversation and said some amazing things about parenting, and spiritual topics. I began to suspect she may be Maitreya or the Master Jesus. She was mainly talking with Samson and said he was very wise for his age. Then, after about 40 minutes, she said: “I’d like to share with you both my favourite saying: ‘All will be well’.” That convinced me it was someone special we were talking to. Samson asked if she was travelling all the way to the city (this was after she’d been talking to us for about 45 minutes) and she looked blankly at us just as the train conductor announced we were at Coopooroo station, and said: “That’s where I get off,” and kept waving at us. She told us she was a 62-year-old woman from England. Samson asked her name and she said it was Roisin (an Irish name). She often touched Samson’s arm and was mainly talking to him about life in general and he was saying stuff to her like “I know all suffering is temporary” – she responded that he was wise, as it is true. Although it can’t be confirmed, I think I already know [this was a special encounter] as she said “all will be well”, which I had read the previous day in Maitreya’s Mission Volume Two as something Maitreya said. She said every night before going to sleep, she tries to think of 10 positive things she’s done that day and then 10 negative things. I said I couldn’t think of 10 positive things I do, and she said it’s about little things like – I got up, I got dressed nicely, I ate healthy food, I was compassionate to someone, etc. Samson and I were pretty stimulated and I was buzzing from the encounter for days afterwards. I’ve been reading Maitreya’s Mission Volume Two and Esoteric Psychology [by A.A. Bailey] for a couple of weeks now, and this encounter has encouraged me. While I was busy preparing for a lecture about miracles, called ‘Signs of the time’, I was blind to the miracle happening right under my nose! My daughter-in-law gave me a birthday present of a photo of my husband and myself with our three grandchildren with whom we have a close bond. I was delighted with the photo since I hardly ever take photos; such a lovely happy atmosphere radiated from it. The photo had a new frame and was covered by glass. One day I was shocked and horrified to see a large grey mark behind the glass; it was just on my ajna centre and the bridge of my nose. I realised immediately that it was vibhuti – an idea I instantly dismissed. Each time I walked past the photo after that I would get irritated by the horrid grey mark on my forehead and nose – although I had been so thrilled by it just days earlier! One morning I’d had enough of the smudge, picked up the photo and realised once again that it really was vibhuti; I took it to my husband, as a witness and asked him to open the frame. We both saw the vibhuti on the photo and saw it suddenly disappear. How often does it happen that we know something intuitively but reject it with our rational minds? How often do we get help and yet not recognize the fact? How close by us are our ‘helpers’ but we don’t realize it? A few weeks later the miracle repeated itself but now on the ajna centre of our three year-old grandson. On 19 February 2003 we were in Vienna, and as we left a clock shop the sound of a flute player touched our hearts deeply. Nearly in the middle of the shopping street at Graben a flute player was sitting playing music from the soundtrack of ‘1492’[ the title of a film 1492: The Conquest of Paradise] and it was touching our hearts so deeply it gave a sense of peace all around. In front of him was sitting a little black dog with a shirt on, and when we put our money into his box we were very surprised that this little dog was a real live dog. At home, still thinking about the flute player and his little black dog touching the souls of men, we wondered who he was? I mentioned that just that morning I had thought about an idea we once had – that we would renew our vows – but that I’d realized that in fact we do this every few days, just spontaneously. We told each other yesterday, for instance, that we each value the other very much, that we are grateful to have been brought together, etc. He answered that God had brought us together; and that even if one dies we’ll still be together. If one dies first, the other would follow shortly after that. We shook hands and we wished him much love in his life and in his marriage of 23 years. He wished us continuing love and happiness. I would like to share this dream, because it has given me a great boost, thinking that perhaps it refers to the beginning of a new stage after the Day of Declaration. One day last August, when I woke up in the morning, the dream I had was very vivid in my memory. The man had the same appearance as in an experience I had a few years ago in a park, when I was sharing Reappearance information: a young man with long dark brown hair with blue jeans and a purple t-shirt. In the dream I knew that he was Maitreya. He asked me if I would be willing to go to work in South America. I replied that yes, and He asked me if I would do it, even though I would not see Nala again, one of the two dogs we have. I nodded again. Maitreya moved away a little to sit on a bench, I followed him and sat on the floor next to the bench. In the autumn of 1993 I was on tour, singing in The Magic Flute. On arriving in York, I and some fellow singers went to York Minster and on entering I felt an almost physical blow and burst into tears. A colleague said she also had a similar experience. I read later in Share International that a healing well had been activated in the York area but had not yet been discovered. What caused my reaction, was it purely emotional? Light patterns on buildings in Kreuzstrasse, in central Karlsruhe, Southern Germany. (‘Kreuz’ means cross in German.) Photographed on 28 September 2017 by S.L., Germany. An electrical fire destroyed three houses on a Texas family’s property during Hurricane Harvey in August 2017, but their statue of the Madonna remained intact. The Rojas family of Robstown, Texas, west of Corpus Christi, said the surviving statue amidst the ashes of their houses gave them a sense of hope. Towards the end of August 2017 my husband and I were both under a lot of pressure (work-related). We were really not well. One morning I sliced open a mango and there, once again, was a sign we had seen before (see SI Nov 2016 “Health warnings” letter) and in a mango again! It is a health warning sign, a zig-zag pattern like an ECG or temperature chart showing spikes and troughs. Once again, I tested to make sure it wasn’t a pattern I was creating by the way I had sliced the fruit. No, the warning only appeared on one slice. Now wise to its meaning, we decided to take it easy and rest as much as possible (while continuing to work!). But since it felt as if there was something wrong I went to the doctor, who is in our neighbourhood. I had to walk slowly and stop now and then and I wondered whether the problem was being caused by my heart. When I got home I had breakfast: I washed and removed a small label from the nectarine I was about to cut. As I removed the label a heart shape appeared – slightly larger than the label. PS The visit to the doctor proved inconclusive: “If the trouble persists come back.…” In the absence of further concrete indications I interpret the heart sign to mean what heart symbols always mean – love. In 1940, at a crucial moment in World War II, thousands of allied forces were stranded on the beaches of Dunkirk, France, trapped by the advancing German army and heavily bombed by the German airforce, the Luftwaffe. Dunkirk has become famous for the massive rescue operation involving hundreds of civilian small boats crossing the channel from Britain to take the troops to safety. At this moment of crisis King George V1 asked the country to ask for God’s help, and millions went to church to pray. Immediately afterwards a violent storm around Dunkirk grounded the Luftwaffe, while at the same time a most unusual calm descended on the Channel. 338,000 soldiers were rescued against all expectations. The event was hailed as a divine miracle; and there were other similar apparently miraculous events that helped the allies, attested to by well-known military, political and religious spokespeople. As a third-degree initiate destined to play a major role in defeating the axis powers, Churchill would have been aware of ‘help behind the scenes’ and of the vital importance of the ‘cause’ he was ‘serving’. For Christians then and now, the miracles came from God and were evidence of divine intervention; Churchill’s ‘Guardian’ was perhaps a more nuanced interpretation of the source of the miracle. 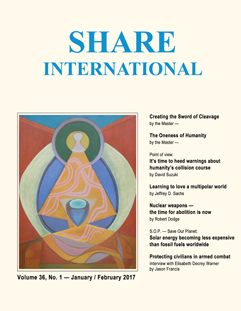 Readers of Share International magazine are used to miracles being presented regularly in these pages, usually manifested by Maitreya or the Master Jesus. The source of the miracles is much less important than the fact of their occurrence, and humanity’s invoking of those miracles through their service to the cause of freedom and progress. In 1945, at the end of the war, Maitreya made the decision to return to the modern world Himself, in response to humanity’s invocative cry for help and its suffering during the war. The new film Dunkirk directed by Christopher Nolan does not mention the miracle, but its release has prompted the circulation of an article from ‘strengthenthefaithful’, urging Christians once again to pray for the safety of our crisis-ridden world. All spiritually-minded people who work for the great cause of humanity’s future may wish to join together in invoking the help of our ‘Guardian’. We present a selection of quotations on the theme of ‘Problems awaiting action’. The quotations are taken from Maitreya (Messages from Maitreya the Christ and Maitreya’s Teachings – The Laws of Life), Benjamin Creme’s Master (A Master Speaks (AMS) Volumes One and Two), and Benjamin Creme’s own writings. It has been two years since Germany opened its borders to over a million refugees, most fleeing the devastating war in Syria. German Chancellor Angela Merkel risked her political career in August 2015, when she suspended the Dublin protocol, an EU policy enacted in 2003 which forces refugees to claim asylum in the first safe country they reach. Her decision enabled refugees who made it to Germany to apply for asylum, without fear that they would be deported to one of the countries they had to pass through to get there. The recent German elections have been called a populist rebuke of Merkel’s courageous decision, and it is widely accepted that the fear stoked by the refugee influx is what won the nationalist, anti-immigration AfD (Alternative for Germany) party enough support that it will now enter parliament – making it the first openly nationalist party to enter the German government in six decades. Like many small villages across Germany, Steyerberg in Lower Saxony – population 5,262 – was told in the autumn of 2015 to expect the arrival of around 100 refugees. A meeting was announced by the mayor and held at the local elementary school, where the 80 townsfolk who attended were informed by county personnel that Germany’s immigration administration was doing all it could to process the refugees in a timely manner, but help by average citizens was absolutely necessary. The villagers were asked to self-organize and arrange housing and German language classes for the coming refugees. A handful of village residents quickly took up the work, co-ordinating a list of volunteers. They set up a Facebook page through which to communicate, organized the collection and distribution of donated clothing and household goods, and offered local German classes for the new arrivals. Villagers volunteered to care for individuals and families to help them with integration, finding bicycles, obtaining medical services, researching educational and work opportunities, practising language skills and filling out notoriously complex German paperwork. Two beneficiaries of these volunteers’ efforts were Aboulaye, now 18, from the Ivory Coast and Ibrahim, now age five, a Syrian of Palestinian descent, who had both crossed treacherous seas in flimsy inflatable rafts to reach the European continent. Fofana, a street kid from the age of 10, had unwittingly followed a friend to make the dangerous crossing from Morocco to Spain, across the Gibraltar Strait. Bewildered by his situation, finding himself in an isolated rural German town, Fofana soon met residents in Steyerberg who also spoke French, his native language. Villagers befriended him and opened their homes, including him in their families’ lives, sharing meals to get to know him and to make him feel at home. Locals helped him to get the support of an official state advocate, as he was still a minor. Steyerberg’s soccer team invited him to join and train with them. With only four years of elementary education, he joined German language classes, and it was arranged for him to attend a vocational training school where he elected to study plumbing. Caring teachers at that school noted his self-discipline and dedication and found him a three-year apprenticeship with a local plumbing company, where he works today. Ibrahim’s middle-class family – his father Mahmoud, a maths professor, then 18-year-old brother Khaled and 10-year-old sister Hadil – had fled Damascus after years of trying to wait out the war. As the violence escalated, they left everything they owned and journeyed, much of the way on foot, to Turkey, then across one of the Mediterranean Sea’s most terrifying routes to Greece, where they were stuck for six months before they were finally able to continue to Germany. Steyerberg resident Lisa Frieling met the Fyad family at a monthly event – Cafe Oase, set up at a local church by her neighbour Claudia Elles to give locals and refugees a chance to meet and get to know each other. Frieling was impressed by the Fyad children’s display of German, so soon after their arrival in the country. “The older children were already translating for the other refugees who still could only speak Arabic. It was remarkable,” she noted. Thousands of Germans have housed refugees, donated clothing and food, and offered language courses. Life After Hate is a Chicago-based nonprofit organization founded in 2011 by former members of the violent far-right extremist movement in the US. The group helps current members of the extremist movement who wish to leave behind a life of violence and hate and move toward compassion and forgiveness. Life After Hate also works with communities as well as educational and government organizations that want to understand and address the causes of extremism. Antony McAleer cofounded Life After Hate and serves as its Board Chair. Having once been involved in violent far right extremism – including spending time as an organizer for the white supremacist group WAR (White Aryan Resistance), he left the movement and changed his life after undergoing his own spiritual journey. Jason Francis interviewed Antony McAleer for Share International. Share International: How did you become involved in violent extremism? Antony McAleer: It was a slow immersion. I didn’t say, “I’m going to sign up for that extremist group. I’m going to show an interest in this group discussing immigration in a critical way.” I was just exposed to more and more ideology and people along the way that resonated with me. SI: How does the violent far-right movement target and recruit people into its cause, and who is most vulnerable to their message? AM: They would often piggyback off of other events. For example, now they would be at gun shows. There is also a newer phenomenon, which is more online based. It is easier to recruit people through social media. But the core of violent extremism is not really about the ideology. It’s about toxic shame – the belief we hold about ourselves that we are not good enough, smart enough, or lovable – which we often pick up in family, school and church. It creates a vacuum, a yearning for identity, purpose, belonging and community. What’s the opposite of shame? It’s pride. So, these movements are often a hyper-expression of pride because the person is lacking that and carrying shame. The deep psychological drivers create these vulnerabilities, which these ideologies can exploit. SI: Could you tell us about the spiritual journey you undertook that motivated you to leave the hate groups you were associated with and begin a life of compassion and forgiveness? AM: This is what is referred to as disengagement. I left the movement behind and disengaged, but I hadn’t dealt with what made it attractive in the first place. The first piece to that spiritual journey was the impact my two children had on me. What my children did (and what compassion does) is hold up a mirror and allow the person to see their humanity reflected back at them when they can’t see it on their own. Being very fact based in my thinking, it took quantum physics to open the door for me to see the spiritual side of it. I began to explore quantum physics, connections, spirituality, psychology, and went through a lot of personal growth and development workshops. I started to do exercises where you experience a connection with other people and things, and work with energy in a way I hadn’t thought of or experienced before. The foundation of these extremist ideologies of separation is the lie we believe about ourselves that we are separate and disconnected from everything and everyone and are alone. When you have an experience of connection at that deeper level – compassion is one way to do that, but there are lots of other ways – and you understand experientially that we are all connected, it crumbles the foundation of that ideology, which is the belief we are all separate. Also, my introduction to meditation was a Vipassana Meditation retreat –10 days of solid meditation with no reading and writing. I didn’t know what I was getting myself into. That was a profound experience for me as well. SI: What inspired you to co-create Life After Hate? AM: As I went through the spiritual journey inwardly to discover myself and who I was, at first I was afraid to be public in any way. I feared for my career, friends and social circle. As I began to explore, among other things, the nature of reality and my role in it, the purpose of why I was here, and as I developed self-forgiveness and compassion for myself, I also developed a sense of accountability. It was my way of holding myself accountable for the actions I had committed. It was a cleansing for me. After awhile I felt compelled to become more public. I inched forward, became vulnerable and took risks. I found the reality didn’t meet the expectations of the fearful part of me. Every step I’ve taken along this journey has enriched and made my life better. In a way I can’t turn back because I am dedicated to improving and enriching my life in a spiritual sense. That means opening up and being vulnerable, sharing my experiences so other people can learn from them. I can help people who are where I was once. My mission in this life is to inspire people to a place of compassion and forgiveness for themselves and all people. SI: What brings a member of the violent extremist movement to Life After Hate? AM: Thoughts of doubt. The reality is not living up to the fantasy. The honeymoon phase wears off. We join for identity, acceptance and approval, but we don’t always get those things. I remember that during my time in the movement life was like swimming upstream. Everything was a struggle. It takes an awful lot of energy to be that angry all the time. Surrounded by people in that movement, I can’t think of a single person in the 15 years I was involved who was experiencing joy on a regular basis. When you spend enough time in that movement you can’t have a good personal relationship. Your relationships will be flawed. All of the factors in your life are going to be failing at some point or to some degree. SI: Could you talk about Life After Hate’s educational process to help communities understand and address the causes of violent extremism? AM: We share our insights with communities that are struggling with this problem. There are certain things these groups thrive on, such as confrontation and violence, and certain things they don’t like. There are common pitfalls to avoid. We try to educate communities about this, show them how to become more resilient and how to starve these groups of what they thrive upon…. SI: In your opinion, how can society do a better job of fostering a sense of unity and belonging, as well as meaning and self-worth, in the lives of young people so they don’t fall into the trap of violence, extremism and tribal identities? AM: We need to return to compassion. We need to look at where we are judgmental in our lives. As long as we are willing to dehumanize anyone for any reason we can never have peace. One of the hardest things to do is have compassion for someone who has no compassion, but those are the very people who need it the most. And we have to be more mindful of young people slipping through the cracks. We are really talking about deep psychological drivers. I believe that child would be willing to believe anything to get acceptance, approval and have friends. So we need to look at how we treat people who are a little bit different such as the way children might marginalize other children in school. If we can create an environment where they don’t feel marginalized and on the ‘outside’, we can prevent this from happening. The timely and inspiring documentary, We The People 2.0, shares stories from communities across the US that are organizing against fracking, pipelines and other ‘corporate harms’. It exposes the structure of US law, which elevates the rights of corporations over the rights of people, communities and nature. And it tells the larger story of an unlikely model for citizen-based democracy that has its roots in a small rural Pennsylvania law firm started in 1995, which eventually became known as the Community Environmental Legal Defense Fund (CELDF). The film’s title refers to the Preamble to the US Constitution, “We the People of the United States, in Order to form a more perfect Union…” with the “2.0” a reference to what the documentary calls the “Second American Revolution” against the power of corporations, so residents can take back their democracy. The work of CELDF plays a central role in the film. In its early days, the law firm helped communities by appealing against corporate permit applications, which, in effect, allowed businesses to legally harm communities via various forms of pollution. The firm proved successful in finding errors in the applications, and the Department of Environmental Protection in Pennsylvania would throw out the permits. Communities, in turn, would celebrate their ‘victory,’ believing the system had worked. But corporations would simply file the next permit application, using the previous appeal to make needed changes to comply with the law. The communities would ask the law firm to appeal again, but there was nothing left to do legally. When states legalize activities such as fracking, mining, water privatization, or factory farming, communities are legally prohibited from saying “no” to these allowable harms. The small legal team at CELDF had a realization: the current legal system is designed to allow, regulate and permit destructive corporate activity. Whatever issue the community is facing, the protests, petitions and prosecutions all have utility, but they cannot stop corporations from causing harm long term. They can only delay it. And why? Becausecorporations have more rights than communities. Corporate rights and powers have been expanding in the US for over 200 years. Today, communities find that corporations – along with state and federal government – are forcing corporate harms into their lives regardless of what the people want…. In 1998, CELDF began drafting laws to help communities across Pennsylvania fight corporate factory farms, and the use of untreated sewage as a ‘soil amendment,’ by asserting the communities’ rights to self-govern. Since then, nearly 200 towns and cities across the US have adopted CELDF-drafted Community Rights laws. With these changes, municipalities transition from merely regulating corporate harms to stopping them, by asserting local, democratic control directly over corporations, something that the Commerce Clause in the US Constitution prohibits. These are first-in-the-nation, groundbreaking laws that are strengthening true democracy in the US, and now in other countries as well. Colombia, Ecuador and India have been inspired to create their own legislation to keep corporate harms out of their communities and provide natural systems with rights. This is why the legal design strategy engineered by CELDF, to circumvent the US Constitution’s Commerce Clause, is worthy of intense study. CELDF advocates a rights-based rather than an environmental regulatory approach to addressing harms. They are successful through organizing people power to stand against accepted and settled law in the US Constitution, akin to the way the Civil Rights Movement in the 1960s stood against legal segregation. Inspiring stories abound of ordinary citizens standing up to big money corporations and big government, and winning, via Community Rights and Rights of Nature legal strategies: from limiting corporate election donations to $100 in Youngstown, Ohio, to reversing mainstream views of nature as property when Colombia’s Constitutional Court found the Atrato River to be a rights-bearing entity. From banning fracking in Eagleford, Texas, to an Indian court declaring the personhood of glaciers and ecosystems. From recognizing the Rights of Nature in Ecuador’s Constitution, to the Citizens Council in Santa Monica, California, unanimously passing a resolution backing a Bill of Rights for the Environment. And the resistance keeps spreading…. It is critical that communities have the chance to see that another way– a sustainable and renewable energy economy – is possible. Communities in Pittsburgh’s region, and other areas around the world under attack from corporate harms, are paying attention to rights-based options. Showing We the People 2.0 to groups of people who are faced with corporate takeover can be an effective way to start a conversation about what kind of democracy they are willing to live with. Step 1: Communities stop threats by building a movement at the grassroots level. CELDF helps build this movement by providing Democracy Schools that teach historical perspectives on why the system is broken and how to fix it through Community Rights education, organizing, and local legislation. CELDF provides legal services free of charge and continues to work with communities via policy support. Step 2:Bring communities together in coalitions to drive change at the state level. CELDF helped build several independent state-level coalitions in Pennsylvania, New Hampshire, Ohio, Colorado, New Mexico, Washington and Oregon. And now these states are collaborating to drive change at the federal level. A Constitutional Reform Convention is being planned. Step 3:Use this model to help international Community Rights and the Rights of Nature efforts. CELDF helped Ecuador recognize the Rights of Nature in its constitution, and is working in other countries, including India, Nepal, Australia, and the European Union. Congressman Dennis J. Kucinich served for 16 years in the US Congress, was mayor of Cleveland, Ohio, and has twice been a candidate for president of the United States. He is the recipient of the Gandhi Peace Award and has campaigned for world peace all his political life. On 26 September 2017, speaking on behalf of the Basel Peace Office (a coalition of international organizations dedicated to the elimination of nuclear weapons) Kucinich delivered a speech to the United Nations General Assembly, at a high-level meeting on nuclear disarmament. “The world is in urgent need of truth and reconciliation over the existential threat of development of and use of nuclear weapons. We have a shared global interest in nuclear disarmament and nuclear abolition, deriving from the irreducible human right to be free of contemplation of extinction. This is the place and now is the time to take confidence-building measures, new diplomatic steps towards averting a nuclear catastrophe, to enact the new ban treaty, to refrain from precipitating nuclear showdowns, to begin anew the quest to eliminate nuclear weapons through reciprocal trust-building. We from Civil Society insist upon structured, legally affirmed nuclear arms treaties compelling nonviolent conflict resolution, mindful of the founding principle of the United Nations to “end the scourge of war for all time”. Today’s world is interdependent and interconnected. Human unity is the first truth. Technology has created a global village. When a greeting can be sent to the other side of the world in a matter of seconds, this represents the constructive power of global citizens, affirming our commonality. Contrast that with a nation sending an intercontinental ballistic missile with a nuclear warhead. There is a thin line between deterrence and provocation. An aggressive expression of nuclear sovereignty is illegal and suicidal. The threat of the use of nuclear weapons nullifies our humanity. Let us hear and heed the demands for peace and nonviolent conflict resolution from the peoples of the world community. Let the nations of the world affirm the evolutionary potential of technology for peace. This great institution cannot do it alone. Each one of us must disarm and abolish any destructive force in our own lives, our own homes and our own communities which breed domestic violence, spousal abuse, child abuse, gun violence, racial violence. The power to do this is in the human heart, where courage and compassion reside, where the transformative power, the conscious willingness to challenge violence anywhere helps to tame that beast everywhere. If we are to eliminate nuclear weapons, we must also eliminate destructive rhetoric. Here we acknowledge the power of the spoken word. Words create worlds. Harsh words, the exchange of threats between leaders, begins a dialectic of conflict, breeding suspicion, fear, reaction, miscalculation and disaster. Words of mass destruction can unleash weapons of mass destruction. The ghosts from Nagasaki and Hiroshima hover over us today, warning us that time is an illusion, that the past, the present and the future are one and can be obliterated in a flash, proving nuclear weapons are a fact of death, not life. Nations must explicitly abandon designs for empire and nuclear dominance. The brandishing of nuclear weapons triggers the inevitability of their use. In the name of all humanity, this must stop. Instead of new nuclear nations and a new nuclear architecture, we need new, clear action to create a world with freedom from fear, freedom from violent expression, freedom from extinction, and a legal framework to match. On behalf of the Basel Peace Office and Civil Society, we say let peace be sovereign. Let diplomacy be sovereign. Let hope be sovereign, through your work and our work. Then we shall fulfill the prophecy that ‘nation shall not take up sword against nation’. In response to President Donald Trump’s “disgraceful” announcement on 13 October 2017 that he will not recertify the nuclear agreement signed with Iran and other leading nations, Senator Bernie Sanders from Vermont condemned the decision as both “rash” and “reckless” and said it was now up to members of the House and Senate to protect the deal. Despite the fact that even Trump’s own national security team said the Iran deal was working and should be upheld, Sanders said Trump’s move will only serve to further isolate the US from the global community – including from key allies. France, the UK, and Germany – signatories to the deal – “all continue to support the agreement and have consistently said that it is in their own national security interests,” said Sanders.